This Holiday season, how about making it about your eyes instead? My best bet? 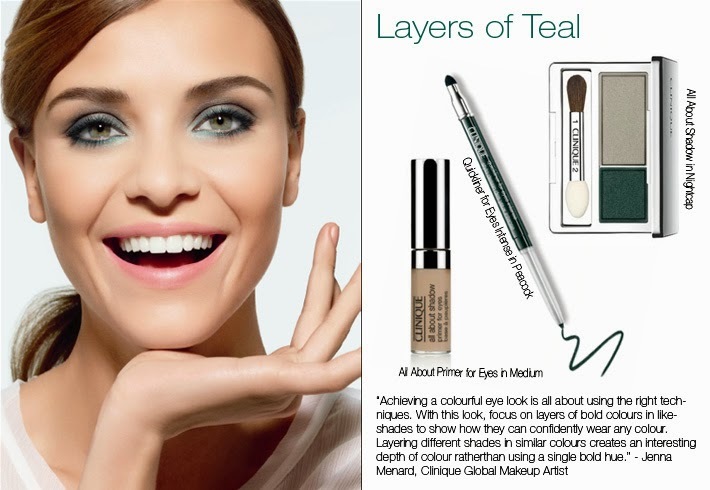 Work layers of teal into your peepers with Clinique's latest eye cosmetics. We all know how great they are and if you've tried the the all NEW All About Shadows and their much-raved about All About Shadow Primer for Eyes, you're sure to bring all the attention to you this holiday. Not only is teal the hottest shade this season, this shade compliments and brings out the beauty of golden skin tones! And it's not as loud as smokey nor as plain as neutrals. Surprise people with this new look! As always, Clinique brings tons of benefits to their cosmetics. Making sure that each shadow has a blend of Astrocaryum Murumuru See Butter and Vitamin E that gives that creamy and silky textures. Say buh-bye to your cheaper ones that looks like they belong more on a chalkboard that on top of your lids. Newbie on shadow application? No worries as these shadows glide effortlessly and blend seamlessly. In Singles (Php900), Duos (Php1,250) or Quads (Php1,800), you're sure to get the same results each time. Adios to creasing! We can't have that when we're out to party the night away in this look! Make your shadow work hard as you do by introducing them first withe the All About Shadow Primer for Eyes (Php1,050). Perfect to prevent creasing. It helps your shadows stay on for eight to twelve hours. And it's available in several shades that best match your skin color; Very fair, Moderately fair, Medium and Deep. Complete your look with Quickliner for Eyes (Php1,100). A soft eye pencil that swoops that your lashline and waterline with little effort. Non-fading, long-wearing of up to 12 hours! My pick? Intense Amethyst and Peacock!